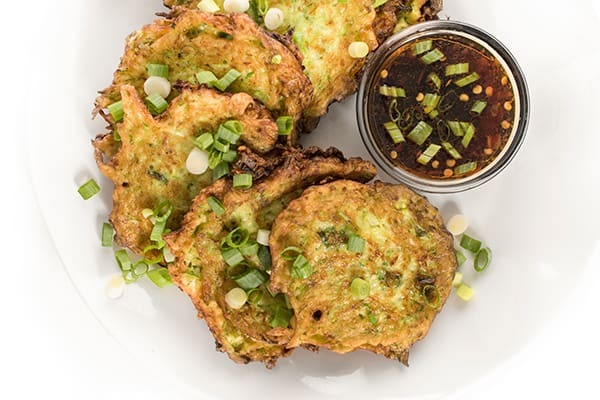 These light and flavorful scallion pancakes are made with zucchini and served with a sweet and tangy Asian-inspired dipping sauce. 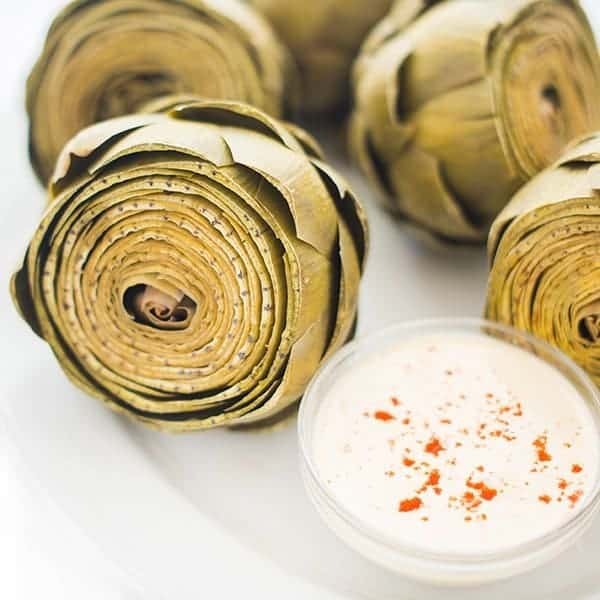 The perfect summer appetizer or side dish recipe! Today’s recipe pays tribute to my favorite Japanese restaurants in Boston: Mr. Sushi. In college, I frequented this restaurant with friends and later in life after I met my husband, he became a huge fan as well. 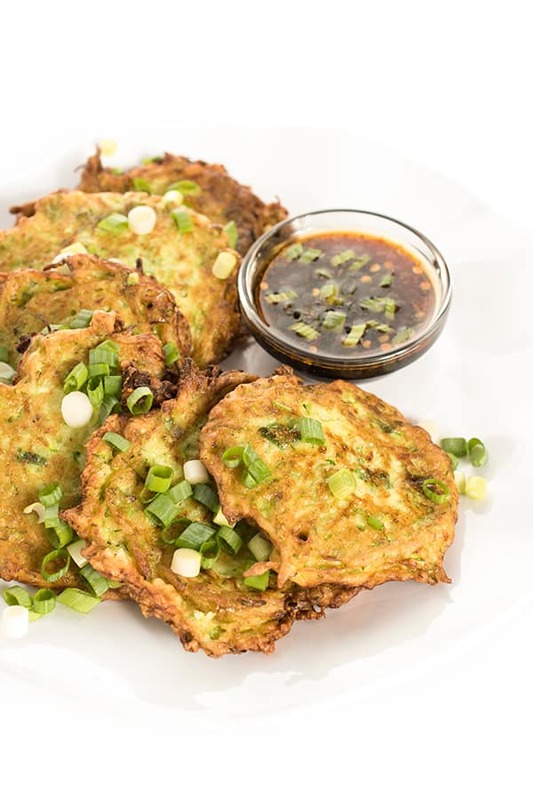 Hands down, our favorite item on the menu was actually an appetizer: the scallion pancake. In true East Coast form, their version was full of succulent crab meat and fragrant scallions. 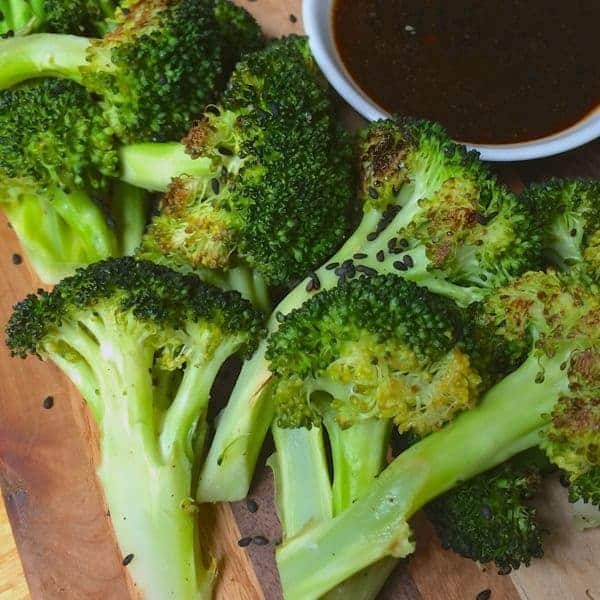 Each bite was full of flavor and paired perfectly with the sweet, soy dipping sauce. My version is a bit lighter for the season and a great use for all of the zucchini popping up around farmer’s markets and backyard gardens this time of year. I hope it becomes a new favorite in your house as it has in ours. 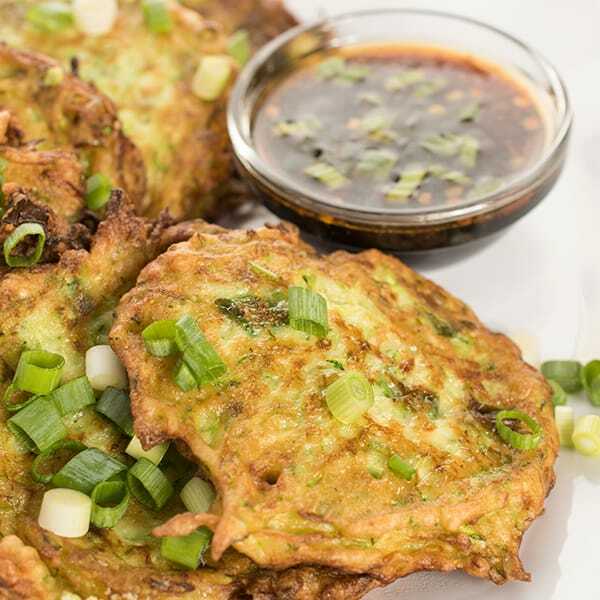 These light and flavorful scallion pancakes are made with zucchini and served with a sweet and tangy Asian inspired dipping sauce. Whisk together soy dipping sauce and set aside. In a medium bowl, combine grated zucchini with scallions, flour, egg and a pinch of salt and pepper to taste. Flip the pancake once it has browned on the bottom (about 2-3 minutes) and cook for additional minute or two on the other side. Continue until all of the pancake mixture is gone. Serve with extra scallions on top and the soy dipping sauce. 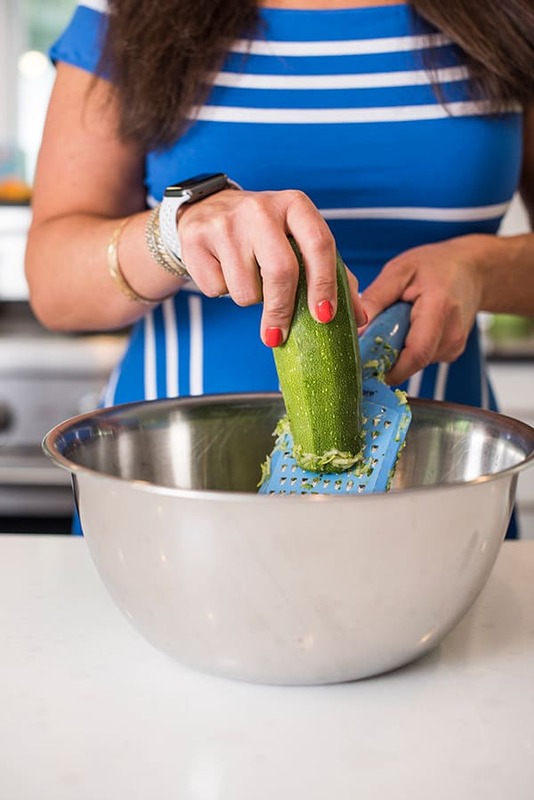 Tip: After grating the zucchini, squeeze dry in a paper towel to remove excess moisture. 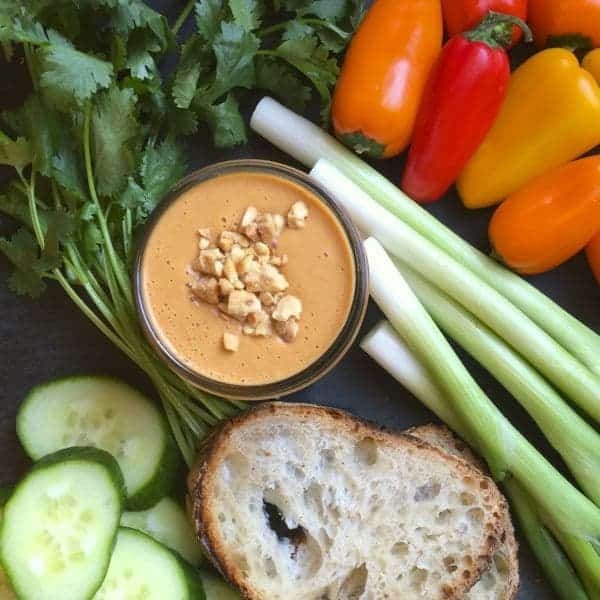 Want more healthy and easy appetizers?? Head over to my Pinterest board to prep for your next party! YES they are growing like weeds here too! These were great for a quick lunch side to go with your easy wonton soup. Did you put the sesame seeds in the batter? Or are those just sprinkled on at the end? These do look really good. I would use coconut oil but was wondering about almond flour as I am GF. I would also have to add LaMar’s Famous Seasoning. I can’t imagine something like this without it. Ooo i’ve never heard of that! I want to try it!! Making these again for dinner. They are GOOD! Oh I’m so glad!!! yay! Just made these for the first time and they are delicious and were so easy to make. I read so many food/cooking blogs and always seem to come back to your recipes. They aren’t complicated and delicious! These look tasty! Do you think olive oil could be used as a substitute for canola? Yes absolutely!! Just be careful because olive oil has a lower smoking point. I just made these last night and they were fantastic! Thanks for such a great recipe. That is great to hear!!! So glad you enjoyed them!! Let me know what you think if you make them!! We are so easy and the sweet soy sauce takes it over the edge. Enjoy! Just made these tonight and LOVED them! Thanks Liz! I’m so glad you liked them!!! We will be making them again this week too. :) Another great version is with parmesan cheese. Enjoy! They are delish! Let me know if you give them a try.